[INTRODUCTION] Symptomatic lymphocele is one of the most frequent complications after kidney transplantation and belongs to the family of perirenal fluid collections such as hematoma and urinoma. Its origin is lymphatic leakage caused by either disrupting lymphatic channels of iliac vessels or the graft itself. Some authors reported significant associations of lymphocele formation with diabetes, new immunosuppressive agents (tacrolimus, mycophenolate mofetil (MMF)), and acute rejection episode. Treatment of this complication should be need, because it is thought to cause graft dysfunction, infection, deep vein thrombosis, abdominal pain or leg edema. The effective treatment of this complication is a surgical drainage of the cavity, which traditionally, is widely opening the wall connecting the lymphocele cavity to the intraperitoneal space. 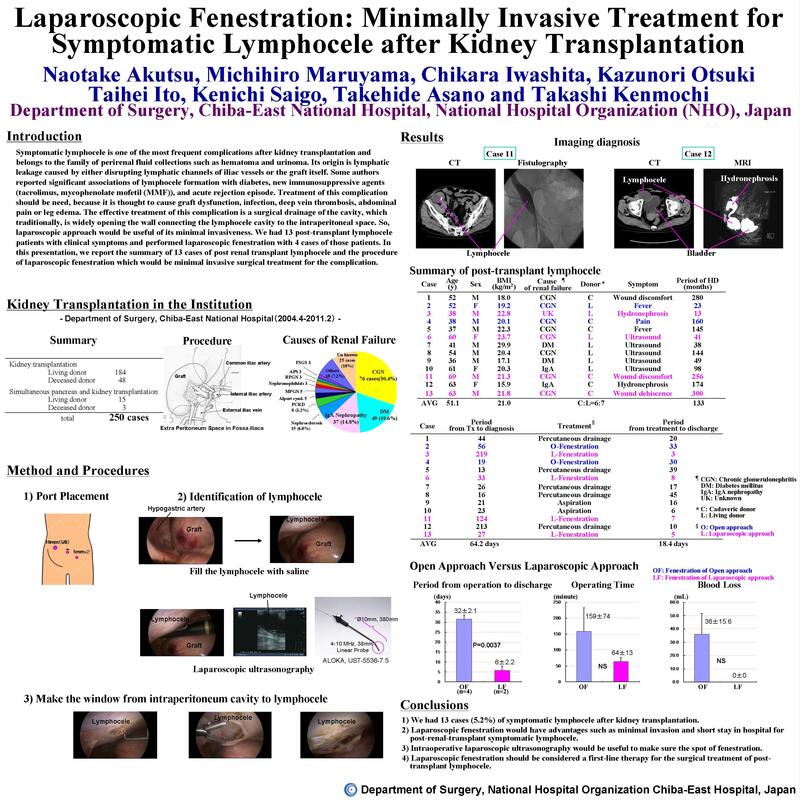 So, laparoscopic approach would be useful of its minimal invasiveness. We had 4 post-transplant lymphocele patients with clinical symptoms. In this presentation, we report the procedure of laparoscopic fenestration and the summary of 4 cases of successfully released from the complication. [METHOD AND PROCEDURES] One hundred and seventy-five patients with renal failure were performed kidney transplantation at our institution between April 2004 and September 2010. Four patients had symptomatic post-transplant lymphocele and underwent laparoscopic fenestration. With this operation, the patient was placed in the supine position. Placements of three working ports were as follows (scope port (5mm); under umbilicus, 12mm port; right upper lateral abdomen, 5mm port; left lower lateral abdomen). We firstly confirmed the location of the cavity with laparoscopic ultrasonography and decided the place of fenestration. We made an enough window from the lymphocele cavity to intraperitoneal space. [RESULTS] The overall incidence of symptomatic lymphocele was 2.3% (4/175). Three were males and one was female. Average of age, height, weight and body mass index were 57.8±13.0 years old, 163.6±6.4cm, 59.9±4.3 kg, 22.4±1.1kg/m2, respectively. Two patients had received cadaveric kidneys and the others had received kidneys from living donor. The mean time from transplantation to diagnosis was 100±90 days (range 27–219 days). The presenting symptoms were elevated serum creatinine concentrations in 4 patients. All patients had been treated initially by percutaneous aspiration, and persistent lymphoceles finally needed other surgery treatment. Total operation time was 63.8±12.7 minutes. An estimated blood loss was almost nothing. Post operative hospitalization period was 5.7±2.2 days. All patients left the hospital without other complications. [CONCLUSIONS] Laparoscopic fenestration would have many advantages such as minimal invasion, short stay in hospital and low recurrence for post-renal-transplant symptomatic lymphocele. And laparoscopic ultrasonography would be useful to make sure the spot of fenestration. It indicates that laparoscopic fenestration should be considered a first-line therapy for the surgical treatment of post-transplant lymphocele.